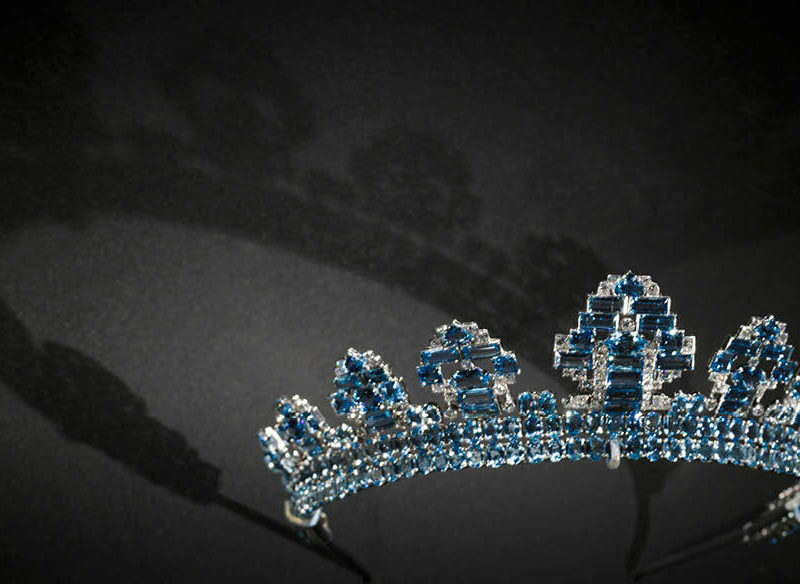 With more than 300 spectacular items worn by Hollywood stars and royalty, the National Gallery of Australia’s window into the world of the Cartier exhibition is enough to make Beyoncé emerald-green with envy, finds Leigh-Ann Pow. As I stand in front of one of the largest sapphires in the world, a whopping 478 carats of glinting, winking loveliness, I find myself questioning the old adage that ‘diamonds are a girl’s best friend’. This deep-blue gobstopper of a stone is serious BFF material. Hell, for this I would put up with a slightly passive aggressive frenemy. And the same applies to the rubies, the citrines, the emeralds, the amethysts, the peridots. All of these precious stones, as well as an (armoured) truckload of diamonds, are on display as part of Cartier: The Exhibition, showing at the National Gallery of Australia in Canberra until July 22. All in all there are 300 items, including a mesmerising array of jewellery pieces – tiaras and diadems, necklaces, stomacher brooches, pendants and bracelets – crafted by the French jewellery house founded in Paris in 1847 by Louis-François Cartier. There’s the ‘Halo’ tiara worn by the then Kate Middleton at her marriage to Prince William (kindly loaned to her by Queen Elizabeth II no less); Dame Nellie Melba’s brooch, and various ‘baubles’ from the likes of Elizabeth Taylor, Princess Grace of Monaco and the Duchess of Windsor, a Cartier devotee. There are staggeringly elaborate pieces made for Indian royalty, including a cascading necklace commissioned by the Maharaja Bhupinder Singh of Patiala, as well as the aforementioned sapphire, which once belonged to Queen Maria of Romania and is displayed with an accompanying portrait of her by artist Philip de Laszlo wearing the exact same jewel. While the sheer bling of it all would make Beyoncé emerald-green with envy, the most luxurious pieces, figuratively, are the more everyday items; the small but exquisitely embellished cigarette and vanity cases that were so in vogue in the 1920s and ’30s, and the watches that the house introduced in the early 20th century. These were lavished with equal craftsmanship and generous precious materials, representing a sizable investment to those who didn’t necessarily have the wealth of a Hollywood star or a Romanian Queen, but who nonetheless wanted to experience the luxury of owning something of such beauty and elegance, and of being part of the Cartier universe. Tickets to Cartier: The Exhibition at the National Gallery of Australia cost $27 for adults, $25 for concession and children 16 years and under are free while accompanied by a paying adult. Join a guided tour of the exhibition (free with exhibition entry) Monday to Friday at 11am, 12.15pm and 2pm, and on weekends, school and public holidays at 11am, 12pm, 2pm and 3.15pm.